Krispy Kreme - I am a huge fan of the product. They do an excellent job of Building Buzz(publicizing new store openings etc. ), Napsteriazing their product(giving people samples as the walk in), Building a Community and other concepts from the book. But I think there is a huge vulnerability to the company. They have, for the time being, a product that can compete favorably on taste. The problem is that the product is not a healthy food. As the circumference of more and more Americans increases the obsession with "healthy" food choices builds remarkably. 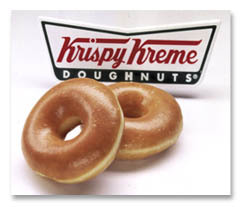 So as the tide of public opinion turns negative towards Krispy Kreme how can they continue to compete? It's all about experience. While people are busy holding up their "Doughnut Theatre"=window and the hot Doughnuts sign in the front window of the store as good examples what gets lost is everything else that makes up the experience of visiting a store and purchasing Krispy Kreme doughnuts. Scarcity- KK has done a good job limiting the number of locations that they open. If they want to maintain the mystique of the product a certain degree of scarcity is a good thing. If they are on every fifth corner like their competitors they will become a commodity easily unseated by a competitors new taste driven product. Build only a few outlets but make them really spectacular experiences. Design- The retro design of their graphics adds authenticity and richness to their brand. This only works because the history of the product extends back to the age of the graphics they are referencing. They need to push the envelope here to keep the graphic identity unique, fresh and an integral part of the experience. Packaging- The flat box works to keep the hot glazed doughnuts from sticking together, however, it is the most unruly, difficult to handle, balance, carry package possible. Want to build some major buzz? How about a Student Design Competition for design students(graphic, product, packaging, engineering.) Explore alternative designs that could enhance the brand experience while strengthening your community by letting customers vote to pick their favorite designs. A jury of passionate brand loyalists can be educated in the many intricacies of package performance criteria like fabrication, costs, distribution, etc. At the very least how about a handle? Stores- The new prototype stores I have seen are simply awful. If you have a unique product why do you put it in a plain box(building) like all the others? The design of the stores is I think the greatest weakness of the brand experience. There is nothing special about them. They could be any franchise business. They have a neon sign in the front window that they light up when they are making doughnuts. Big Deal. It's a communication tool not a brand experience. What if the whole building changed color when they are making doughnuts? Doughnut Theater? In it's present form it's great marketing speak for a "window." Sure it's fun to watch the doughnut machine. But there is so much more potential to create an immersive experience that will be a "must do" for customers. What if Disney's Imagineers designed the doughnut machine experience? They need to hire world class architects to design their stores. What if Frank Gehry or David Rockwell designed their stores. More buzz. More experience. Would these things cost more? Absolutely!! But if Krispy Kreme wants to continue to build an nurture amazing brand and customer loyalty and in fact develop Customer Evangelists they need to innovate and craft a huge experience to prepare them selves to face the market challenge they will be facing in the future as the obesity issue comes to the forefront of the American culture. If not they will become a commodity and be forced to play the advertising and promotion game like their competition. Sure, Krispy Kreme is expanding globally but if the brand wanes in it's American home it will more rapidly wane overseas as well. If it thrives it will thrive! Krispy Kreme is toast, a cooling fad that burned too bright, too quickly. Kind of reminds me of the Iomega Zip drive hype of the mid-90's. Showing up at the office with a box of Krispy Kremes and you might as well be wearing parachute pants and a sweat band--all hip things for a while but not something you want to be associated with now. They're donuts, let's not forget that. And while they might be tasty, one tires of them quickly. Low fat donuts have finally been invented and they are damn good! less than 4 grams of fat for a large boston cream donut just rocks! really check it out!